National Ensemble of Popular Dance, predecessor of Algerian National Ballet founded in 1967, prides several prizes at dance festivals of many countries. Being reorganized to National Ballet under Ministry of Culture in 1992, the company has performed more than 2500 times over 45 years at more than 60 countries. Their dance which represents various folklore of Algeria, a living mosaic of glamorous heritage, is accompanied by the tune of folk musical instruments, and takes the audience to the voyage to entire Algeria with colorful and distinctive costumes; from gorgeous nothern cities to southern desert of Touareg, moutainous Kabylie. 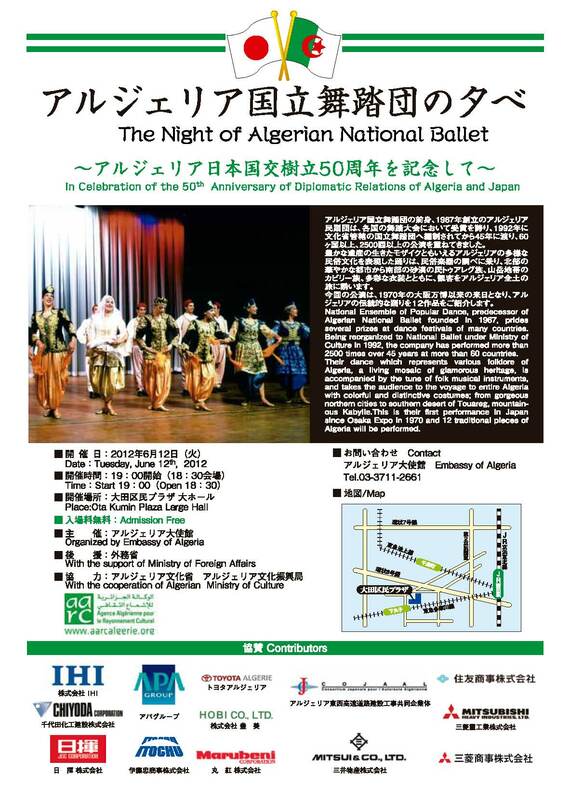 This is their first performance in Japan since Osaka Expo in 1970 and 12 traditional pieces of Algeria will be performed.